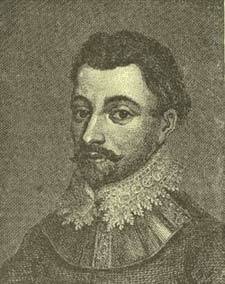 Francis Drake, the first British circumnavigator of the globe, was born in Devonshire, of humble parents. So much is admitted; with respect to the date of his birth, and the method of his nurture, the annalists, Camden and Stowe, are not agreed. By the latter we are told that Drake was born at Tavistock, about 1545, and brought up under the care of a kinsman, the well-known navigator, Sir John Hawkins. Camden, on the other hand, anticipates his birth by several years, and says that he was bound apprentice to a small shipowner on the coast of Kent, who, dying unmarried, in reward of his industry bestowed his bark upon him as a legacy. Both accounts agree that in 1567 he went with Hawkins to the West Indies on a trading voyage, which gave its color to the rest of his life. Their little squadron was obliged by stress of weather to put into St. Juan de Ulloa, on the coast of Mexico; where, after being received with a show of amity, it was beset and attacked by a superior force, and only two vessels escaped. To make amends for his losses in this adventure, in the quaint language of the biographer Prince, in his "Worthies of Devon," "Mr. Drake was persuaded by the minister of his ship that he might lawfully recover the value of the King of Spain by reprisal, and repair his losses upon him anywhere else. The case was clear in sea divinity; and few are such infidels as not to believe in doctrines which make for their profit. Whereupon Drake, though then a poor private man, undertook to revenge himself upon so mighty a monarch." In the years 1570-71 Drake made two voyages to the West Indies, apparently to gain a more precise acquaintance with the seas, the situation, strength, and wealth of the Spanish settlements. In 1572 he sailed with two ships, one of seventy-five tons, the other of twenty-five tons, their united crews mustering only seventy-three men and boys, all volunteers. His object was to capture the now ruined city of Nombre de Dios, situated on the Isthmus of Panama, a few miles east of Porto Bello, then the great repository of all the treasure conveyed from Mexico to Spain. Off this coast of America his little armament was augmented by an English bark, with thirty men on board; so that, deducting those whom it was necessary to leave in charge of the ships, his available force fell short of a hundred men. This handful of bold men attacked the town, which was unwalled, on the night of July 22d, and found their way to the marketplace, where the captain received a severe wound. He concealed his hurt until the public treasury was reached; but before it could be broken open, he became faint from loss of blood, and his disheartened followers abandoned the attempt, and carried him perforce on board ship. Such at least, is the account of the English; there is a Portuguese statement in "Hakluyt's Voyages," vol. iii., p. 525, less favorable both to the daring and success of the assailants. Failing in this attempt, Drake continued for some time on the coast, visiting Carthagena and other places, and making prize of various ships; and if we wonder at his hardihood in adventuring with such scanty means to remain for months in the midst of an awakened and inveterate enemy, how much more surprising is it that the wealthy, proud, and powerful monarchy of Spain should so neglect the care of its most precious colonies, as to leave them unable to crush so slight a foe! The English appear to have felt perfectly at their ease; they cruised about, formed an intimate alliance with an Indian tribe, named Symerons, the bond of union being a common hatred of the Spaniards, and built a fort on a small island of difficult access, at the mouth of a river, where they remained from September 24 to February 3, 1573. On the latter day, Drake set forth with one portion of his associates, under the conduct of the Symerons, to cross the isthmus. On the fourth day they reached a central hill, where stood a remarkable "goodly and great high tree, in which the Indians had cut and made divers steps to ascend up neere unto the top, where they had also made a convenient bower, wherein ten or twelve men might easily sitt; and from thence wee might without any difficulty plainly see the Atlantic Ocean, whence now wee came, and the South Atlantic (i.e., Pacific), so much desired. After our captain had ascended to this bower with the chief Symeron, and having, as it pleased God at that time, by reason of the brize, a very faire day, had seen that sea of which he had heard such golden reports, he besought Almighty God of his goodness to give him life and leave to sayle once in an English ship in that sea." We quote from a tract entitled "Sir Francis Drake Revived," written by some of Drake's companions, corrected, it is said, by himself, and published by his nephew in 1626, which contains a full and interesting account of this adventurous expedition. The admiral of the Spanish Armada surrenders to Drake. Drake's present object was to intercept a convoy of treasure on the way from Panama to Nombre de Dios. By this route the treasures of Peru and Chili, as well as Mexico, were brought to Europe, for the passage round Cape Horn was then unknown, and no ship but Magellan's had yet accomplished the passage round the world to Europe. Guided by the Symerons, the English approached Panama, learned that a valuable treasure was expected to pass, and beset the lonely forest road which it had to travel. But the haste of one drunken man gave a premature alarm, in consequence of which the march of the caravan was stopped; and Drake with his party, their golden hopes being thus defeated, forced their way through Venta Cruz, and returned by a shorter route to their encampment, after a toilsome and fruitless journey of three weeks. It was not till April 1st, that the long-desired opportunity presented itself, on which day they took a caravan of mules laden with silver and a small quantity of gold. They carried off part of the spoil, and buried about fifteen tons of silver; but on returning for it, they found that it had been recovered by the Spaniards. Drake returned to England, August 9, 1573. In dividing the treasure he showed the strictest honor, and even generosity; yet his share was large enough to pay for fitting out three ships, with which he served as a volunteer in Ireland, under the Earl of Essex, and "did excellent service both by sea and land in the winning of divers strong forts." In 1577, he obtained a commission from Queen Elizabeth to conduct a squadron into the South Seas. What was the purport of the commission we do not find; it appears from subsequent passages that it gave to Drake the power of life and death over his followers; but it would seem from the queen's hesitation in approving his proceedings, that it was not intended to authorize (at least formally) his depradations on Spanish property. With five ships, the largest the Pelican, of one hundred tons burden, the smallest a pinnace of fifteen tons, manned in all with only 164 men, Drake sailed from Plymouth, November 15, 1577, to visit seas where no English vessel had ever sailed. Without serious loss, or adventure worthy of notice, the fleet arrived at Port St. Julian, on the coast of Patagonia, June 20, 1578. Here the discoverer Magellan had tried and executed his second in command on the charge of mutiny, and the same spot did Drake select to perform a similar tragedy. He accused the officer next to himself, Thomas Doughty, of plots to defeat the expedition and take his life; plots undertaken, he said, before they had left England. "Proofs were required and alleged, so many and so evident, that the gentleman himself, stricken with remorse, acknowledged himself to have deserved death;" and of three things presented to him, either immediate execution, or to be set on shore on the main, or to be sent home to answer for his conduct, he chose the former; and having at his own request received the sacrament, together with Drake, and dined with him in further token of amity, he cheerfully laid his head on the block, according to the sentence pronounced by forty of the chiefest persons in the fleet. Such is the account published by Drake's nephew, in "The World Encompassed," of which we shall only observe, without passing judgment on the action, that Drake's conduct in taking out a person whom he knew to be ill affected to him, was as singular as is the behavior and sudden and acute penitence attributed to Doughty. But we have no account from any friend of the sufferer. It is fair to state the judgment of Camden, who says, "that the more unprejudiced men in the fleet thought Doughty had been guilty of insubordination, and that Drake in jealousy removed him as a rival. But some persons, who thought they could see farther than others, said that Drake had been ordered by the Earl of Leicester to take off Doughty, because he spread a report that Leicester had procured the death of the Earl of Essex." Having remained at Port St. Julian until August 15th, they sailed for the Straits, reached them August 20th, and passed safely into the Pacific, September 6th, with three ships, having taken out the men and stores, and abandoned the two smaller vessels. But there arose on the 7th a dreadful storm, which dispersed the ships. The Marigold was no more heard of, while the dispirited crew of the Elizabeth returned to England, being the first who ever passed back to the eastward through Magellan's Strait. Drake's ship was driven southward to the fifty-sixth degree, where he ran in among the islands of the extreme south of America. He fixes the farthest land to be near the fifty-sixth degree of south latitude, and thus appears to claim the honor of having discovered Cape Horn. From September 7th to October 28th, the adventurers were buffeted by one continued and dreadful storm; and in estimating the merits of our intrepid seamen, it is to be considered that the seas were utterly unknown, and feared by all, those who had tried to follow in Magellan's course having seldom succeeded, and then with much pain and loss, and little fruit of their voyage; that their vessels were of a class which is now hardly used for more than coasting service; and that the imperfection of instruments and observations laid them under disadvantages which are now removed by the ingenuity of our artists. Add to this, that as the Spaniards gave out that it was impossible to repass the Straits, there remained no known way to quit the hostile shores of America, but by traversing the unexplored Pacific. The storm at length ceased, and the lonely Pelican (which Drake, however, had renamed the Golden Hind) ran along the coast of Lima and Peru, reaping a golden harvest from the careless security of those who never thought to see an enemy on that side of the globe. There is something rather revolting, but very indicative of the temper of the age, in the constant reference to the guidance and protection of God, mixed with a quiet jocularity with which "Master Francis Fletcher, preacher in this employment," from whose notes the "World Encompassed," which is a narrative of this voyage, was compiled, speaks of acts very little different from highway robbery, such as would now be held disgraceful in open war; as for instance, on meeting a Spaniard driving eight llamas, each laden with one hundred pounds' weight of silver, "they offered their service without entreaty, and became drovers, not enduring to see a gentleman Spaniard turned carrier." Enriched by the most valuable spoil, jewels, gold, and silver, Drake steered to the northward, hoping to discover a homeward passage in that quarter. In the forty-eighth degree of north latitude, in what is now the State of Washington, he was stopped by the cold; and, determining to traverse the Pacific, he landed, careened his ship, and, in the queen's name, took possession of the country, which he named New Albion, September 29, 1579; he sailed again, and reached the Molucca Islands November 4th. In his passage thence to the island of Celebes, he incurred the most imminent danger of the whole voyage. The ship struck, as they were sailing before a fair wind, on a reef of rocks, so precipitous that it was impossible to lay out an anchor to heave her off. They stuck fast in this most hazardous situation for eight hours. At the end of that time the wind shifted, and the ship, lightened of part of her guns and cargo, reeled off into deep water, without serious injury. Had the sea risen, she must have been wrecked. This was Drake's last mishap. He reached Plymouth in the autumn of 1580, after nearly three years' absence. Accounts differ as to the exact date of his arrival. Since Drake had for this voyage the queen's commission, by which we must suppose the license to rob the Spaniards to have been at least tacitly conceded, he seems to have been rather hardly used, in being left from November to April in ignorance how his bold adventure was received at court. Among the people it created a great sensation, with much diversity of opinion; some commending it as a notable instance of English valor and maritime skill, and a just reprisal upon the Spaniards for their faithless and cruel practices; others styling it a breach of treaties, little better than piracy, and such as it was neither expedient nor decent for a trading nation to encourage. During this interval, Drake must have felt his situation unpleasant and precarious; but the queen turned the scale in his favor by going, April 4, 1581, to dine on board his ship at Deptford, on which occasion she declared her entire approbation of his conduct, and conferred on him the honor, and such it then was, of knighthood. His ship she ordered to be preserved as a monument of his glory. Having fallen to decay, it was at length broken up: a chair, made out of its planks, was presented to the University of Oxford, and probably is still to be seen in the Bodleian Library. Cowley wrote a Pindaric ode upon it. Drake had now established his reputation as the first seaman of the day; and in 1585 the queen, having resolved on war, intrusted him with the command of an expedition against the Spanish colonies. He burnt or put to ransom the cities of St. Jago, near Cape Verde, St. Domingo, Carthagena, and others, and returned to England, having fully answered the high expectations which were entertained of him. He was again employed with a larger force of thirty ships, in 1587, with which he entered the port of Cadiz, burnt ten thousand tons of shipping, which were to form part of the Armada, took the castle of Cape St. Vincent, and sailing to the Azores, made prize of a large and wealthy ship on its way from the Indies. Still more eminent were his services against the Armada in the following year, in which he served as vice-admiral under Lord Howard of Effingham. But these are well-known passages of history, and we have shortened our account of them, to relate at more length the early incidents of Drake's adventurous life. In 1589 Sir Francis Drake and Sir John Norris were joined in the command of an expedition, meant to deliver Portugal from the dominion of Spain. This failed, as many expeditions have done in which the sea and land services were meant to act together; and as usual, each party threw the blame on the other. Drake's plan appears to have been most judicious: it was at least accordant with his character, downright and daring. He wished to sail straight for Lisbon and surprise the place; but Norris was bent on landing at Corunna, where he did indeed some harm to the Spaniards, but no service toward the real objects of the expedition. When the land forces did at last besiege Lisbon, Drake was unwilling or unable to force his way up the Tagus to co-operate with them, and for this he was afterward warmly blamed by Norris. He defended himself by stating that the time misspent by the English at Corunna, had been well employed by the Spaniards in fortifying Lisbon; and we fully believe that neither fear nor jealousy would have made him hesitate at anything which he thought to be for the good of the service. This miscarriage, though for a time it cast something of a cloud upon Drake's fame, did not prevent his being again employed in 1595, when the queen, at the suggestion of himself and Sir John Hawkins, determined to send out another expedition against Spanish America, under those two eminent navigators, the expenses of which were in great part to be defrayed by themselves and their friends. Great hope was naturally conceived of this expedition, the largest which had yet been sent against that quarter, for it consisted of thirty vessels and 2,500 men. The chief object was to sail to Nombre de Dios, march to Panama, and there seize the treasure from Peru. But the blow, which should have been struck immediately, was delayed by a feint on the part of the Spaniards to invade England; the Plate fleet arrived in safety, and the Spanish colonies were forewarned. Hawkins died, it was said of grief at the ruined prospects of the expedition, November 12th, while the fleet lay before Porto Rico; and on the same evening Drake had a narrow escape from a cannon-ball, which carried the stool from under him as he sat at supper and killed two of his chief officers. 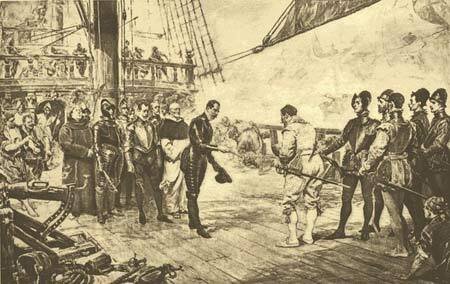 Repulsed from Porto Rico, the admiral steered for the Spanish main, where he burnt several towns, and among them Nombre de Dios. He then sent a strong detachment of 750 men against Panama; but they found the capture of that city impracticable. Soon afterward he fell sick of a fever, and died January 28, 1596. His death, like that of his coadjutor, is attributed to mental distress, and nothing is more probable than that disappointment may have made that noxious climate more deadly. Hints of poisoning were thrown out, but this is a surmise easily and often lightly made. "Thus," says Fuller, in his "Holy State," "an extempore performance, scarce heard to be begun before we hear it is ended, comes off with better applause, or miscarries with less disgrace, than a long-studied and openly premeditated action. Besides, we see how great spirits, having mounted up to the highest pitch of performance, afterward strain and break their credits in trying to go beyond it. We will not justify all the actions of any man, though of a tamer profession than a sea-captain, in whom civility is often counted preciseness. For the main, we say that this our captain was a religious man toward God, and his houses, generally speaking, churches, where he came chaste in his life, just in his dealings, true of his word, and merciful to those that were under him, hating nothing so much as idleness." To these good qualities we may add that he was kind and considerate to his sailors, though strict in the maintenance of discipline; and liberal on fit occasions, though a strict economist. He cut a water-course from Buckland Abbey to Plymouth, a distance of seven miles in a straight line, and thirty by the windings of the conduit, to supply the latter town with fresh water, which before was not to be procured within the distance of a mile. He is honorably distinguished from the atrocious race of buccaneers, to whom his example in some sort gave rise, by the humanity with which he treated his prisoners. And it should be mentioned, as a proof of his judicious benevolence, that in conjunction with Sir John Hawkins, he procured the establishment of the Chest at Chatham for the relief of aged or sick seamen, out of their own voluntary contributions. The faults ascribed to him are ambition, inconstancy in friendship, and too much desire of popularity. In person Drake was low, but strongly made, "well favoured, fayre, and of a cheerefull countenance." He left no issue: his nephew was created a baronet by James I., and the title is still extant.